It's time to celebrate y'all — the U.S. Supreme Court ruled to legalize gay marriage nationwide, and you can bet Angelenos will be out and about to show their love for SCOTUS and its landmark decision. 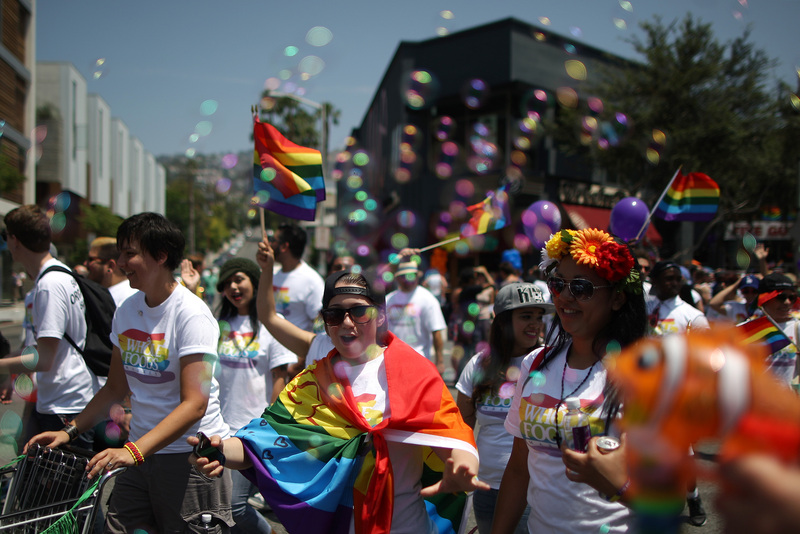 Now, the ruling didn't come in time for L.A.'s annual Gay Pride Festival, which took place June 12 to June 14. But trust me, there are plenty of other ways to celebrate gay marriage in Los Angeles, no matter where you are or how you want to party. SCOTUS' decision doesn't change too much in California since the state legalized gay marriage a little more than two years ago. California has one of the biggest populations of LGBT residents in the country, according to a 2013 Gallup poll, and another more recent poll ranked Los Angeles as a city with one of the highest LGBT populations in the country. Those kinds of numbers have made L.A. a major LGBT capital in the world, and much of that love is concentrated in one particular place. Affectionately called "WeHo," the City of West Hollywood (yes, it is a city with its own mayor and city council) is the mecca for the LGBT community in the greater Los Angeles area. As of 2013, 39 percent of WeHo residents were gay men. Whether you're gay or straight, the city has choice restaurants and a vibrant nightlife. It's also home to the famous Halloween Carnaval on Santa Monica Boulevard, the largest street party in the United States. I love West Hollywood and have fond, though slightly blurred, memories with friends at Rage, Circus Disco, or the Abbey. But Los Angeles is a big town, and I promise celebrations will be happening everywhere, from the beach to downtown. This list undoubtedly has to start with the Abbey. It was a hotspot then, and it's still a hotspot now. The food and drinks are A++, and the go-go dancers are hot. The venue has a solid dance floor for turning up and an open patio area if you want to relax and debate over your favorite justice (RBG!). It's also in the heart of WeHo so if you want a change of venue, no problem! Classic and all-American — Hamburger Mary's, that is not. The iconic gay bar is a staple in the WeHo scene for Sunday night drag queen bingo. A girlfriend of mine celebrated her birthday here, and its burlesque shows are a can't-miss. The bathroom has ABBA's "Dancing Queen" on repeat, and yes, the burgers are good. There are other Hamburger Mary's locations, but this one takes the cake. Yes, I'm putting the public roads and walkways as a destination because the day of SCOTUS' ruling will undoubtedly have people taking to the streets. If you're a big people watcher, grab some coffee (spiked preferably) and mosy on over. Just be careful of where you leave your car — WeHo has notoriously complicated street parking signs. For daytime fun, I'm choosing Venice Beach's boardwalk, where free spirits and free love thrives. Grab a graffiti permit and spray-paint the good news on a public wall. Collaborate with other 420-friendly folks. Rent a bike and play "I Will Survive" on blast as you pedal your way up to Santa Monica. Pull out a blanket and watch a Cali sunset. Hit up any of the bars and step out onto the sand. The choices are endless. If you want to celebrate the cultural way, check out Outfest Los Angeles, a LGBT film festival that promotes creating, sharing, and telling LGBT stories on the silver screen. What better way to immerse yourself in a gay-positive environment than watching movies from up-and-coming filmmakers? During last year's Outfest, I watched my friend's fabulous comedy Helicopter Mom at the Ford Amphitheatre, and sitting outside on a clear summer night was a peaceful way to feel plugged into the LGBT cause. Outfest runs July 9 to July 19. If you want to capture the quintessential romantic image solidifying the country's new frontier on love, head over to LACMA and set up your own photo shoot with your SO at the Urban Light exhibit. In May, the artist Chris Burden died, but his legacy will continue with your iconic LGBT shot. Urban Light is outdoors, free, and beautiful at night. WeHo usually gets all the attention, but Silver Lake also has a solid LGBT community. If you're looking for a dive bar experience, head on over to Eagle LA for a night of beer and leather-clad friends. The crowd is definitely older and more laid back, and it's a good escape from the typical WeHo night. Little known fact: Downtown Los Angeles was a gay hotspot for decades before the community settled in WeHo. In the last couple years, DTLA has boomed in popularity, including with the city's gay population, and the city's urban center is set to open two new gay bars. As a current DTLA resident, I can't wait. Redline will open in the Historic Core in August 2015, while Precinct's grand opening is still unannounced. So assuming SCOTUS' ruling will last you at least a solid two months of good feels, you can cap off your celebration with the grand opening of Redline. This is a historic win guys so you should be in a celebratory mood all year long — and pretty much the rest of your life.